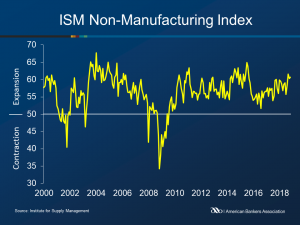 The ISM Non-Manufacturing Index registered 56.7 points in January, 1.3 percentage points down from December’s figure. This was the 108th consecutive month of expansion as a reading above 50 indicates growth. Eleven non-manufacturing industries reported growth, while seven reported a contraction. Respondents are concerned about the impacts of the government shutdown but remain mostly optimistic about overall business conditions. Non-manufacturing employment grew for the 59th consecutive month. The index decreased 1.2 points to 57.8. Ten industries reported increased employment, while four reported decreased employment. The New Orders Index decreased 5.0 points to 57.7. Ten industries reported increased business activity, while five reported decreased activity.